An inspiring resto thread, well done, bookmarked for future reference! Good idea. The softtopper has been very easy to work with so far. Still haven't found a suitable Drivers Gray Carpeted Kick-Panel. If anyone has a lead on one, let me know. Is your Softtopper also quite hard to snap shut near tailgate? The last 3? I got mine used, is there some spacers or something that go between roof and aluminum Softtopper mounting bar? I think I might try some washers under there. Aren't the kick panels carpeted simply plastic covered with carpet? Or is it a different design? Last edited by ev13wt; 10-25-2018 at 12:17 PM. OME Dakar’s were way too stiff, bouncy, and high (even not broken in), so I removed the 3rd leaf down - per instructions from ARB on another thread on here. Fingers crossed these are now perfect. 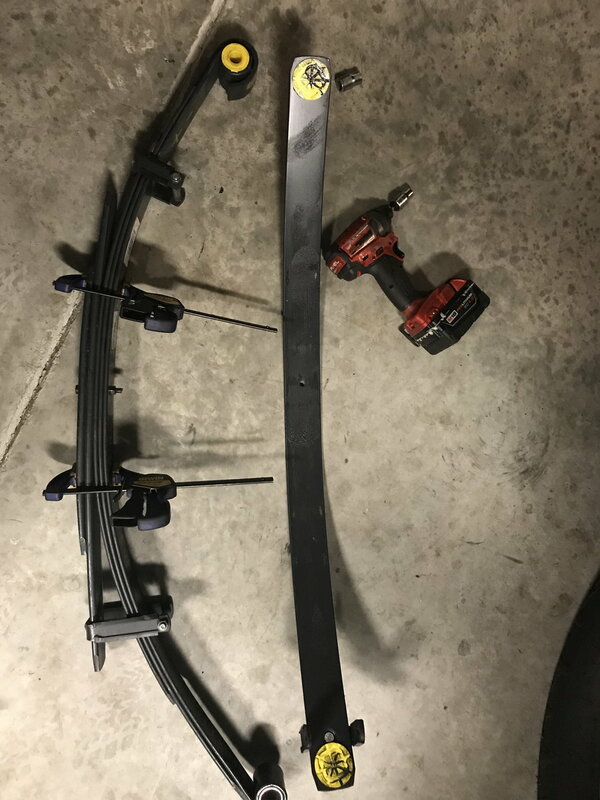 Thank you so much, Im rebuilding my mother in laws 1989 4runner V6 and could not find a suitable rear leaf spring, this is a great help. Thank you. Did you repaint the fiberglass top? Last edited by cdd408; 11-07-2018 at 07:39 PM. My softtopper is hardest to snap near the cab. I've been told it's easiest if you let it sit in the sun for a bit before you snap it all together. It's definitely hard in the garage on cold days! Not sure about the Drivers Carpeted Kick-Panel - but I really want an OEM one. It's STILL my only missing piece on the build! If anyone has one, PM me! Awesome. The Rear OME Dakar springs have been great - especially with the 3rd leaf removed. No, it's in good condition in OEM Black. I actually haven't taken it off the garage ceiling since I first put it up there. I've had the SoftTopper in 20 degree weather with no problems - not sure I'll ever put the hardtop back on! My Slow, budget friendly Build/ Restoration!